Explore McLaganLive. We've re-imagined the way we deliver data. benchmark pay for their key talent. Build a custom report with multiple job families or positions, providing an overview of pay position and firm ranking that's ready for executives. Access Insights Instantly - Select a survey. Select a country. Select a job. It's that easy. 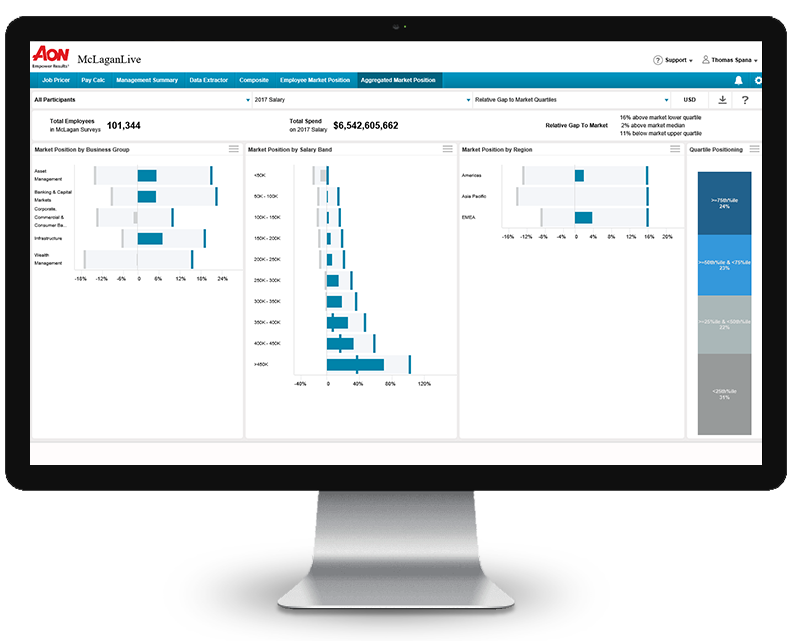 Actionable Visualizations - Our interactive platform gives you the freedom to explore compensation data on the fly. Quickly understand how compensation levels progress across job levels and pay elements for every job that matters to you. Customize Your Results - Create your own custom reports as you see fit. We have all the base salary, incentive, bonus, and equity reward data that you need. For a complete list of our data elements, please contact our team. The market for talent continues to shift rapidly, so it is critical to ensure you have the market data you need, when and how you need it. 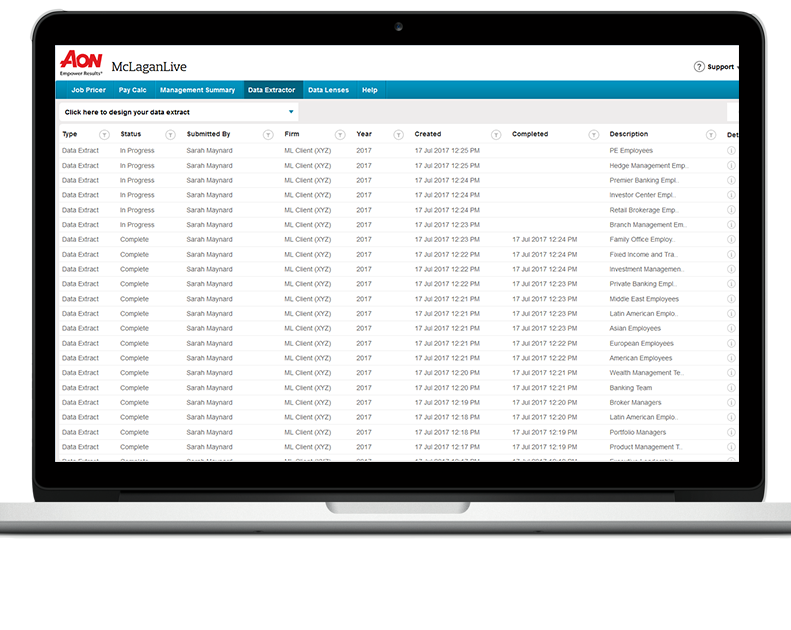 Leverage our Data Extractor to create custom extracts of market data for ad hoc research requests or to import data into your HRIS systems. Our teams are available to partner with you to customize your talent and rewards strategies to meet your business objectives. 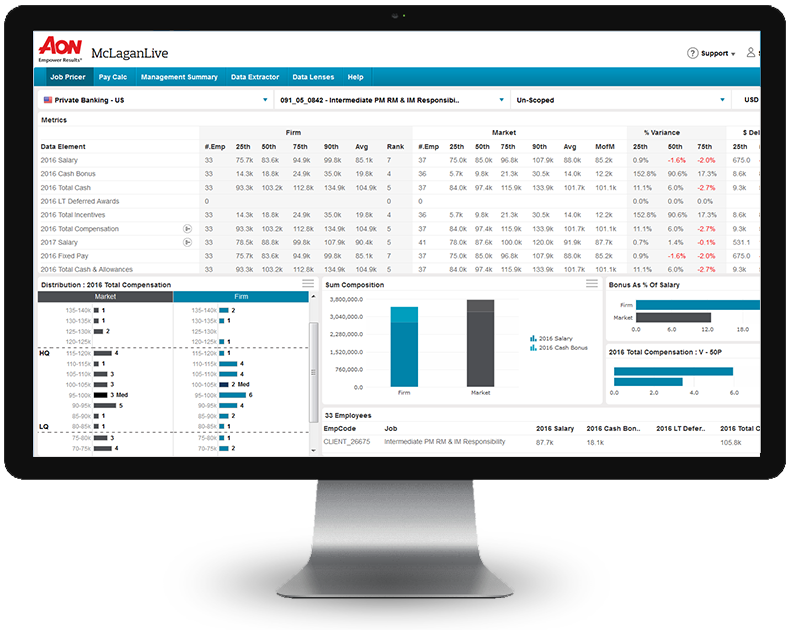 For additional fees, McLagan clients can access McLaganLive premium apps for deeper and more customizable insights. Contact us to learn more and recieve a demo. Aggregated Market Position (AMP) - Go straight to the big picture with this top down view of your organization's compensation competitiveness. Employee Market Position (EMP) - Drill into detail with a custom compensation report on a group of individuals. Composite - Blend multiple jobs together for the perfect benchmark. With McLagan, you'll gain access to your firm's global compensation data, performance benchmarking analytics, and talent insights. With McLaganLive, you'll be able to interact with it all. We have been providing clients with the most in-depth, comprehensive financial services compensation data for over 50 years. We partner with our clients, balancing quantitative and qualitative data to solve their most pressing rewards challenges. Our specialists benchmark financial data and help clients optimize their business strategies and allocate resources efficiently. We provide solutions across the employee lifecycle, allowing our clients to assess, select, and engage top talent. McLaganLive has arrived. Schedule your demo today. Learn how you and your HR team can access comprehensive compensation market data and design effective total rewards strategies around the world.